Things red, round and small are pretty good for your auspicious future, especially during the New Year season. Daruma is one of them, but there are others. Why is the Tumbler Doll Daruma always of RED color? Red was the color of the robe of a high-ranking priest and since Daruma Daishi was the founder of the Zen Sect, he must have worn a red robe. The patterns painted in gold on the doll represent the Buddhist stole that a priest wore. During the Edo Period, Daruma came to be seen by the townspeople as the healer of smallpox. Nowadays we have medicine to cure this illness, but in former times children suffered a lot from this and other diseases. It was believed that RED would ward off diseases, so the Red Daruma Doll with a threatening face became the preventor and healer of sickness. Modern medicine has found out that the color red really helps prevent smallpox! 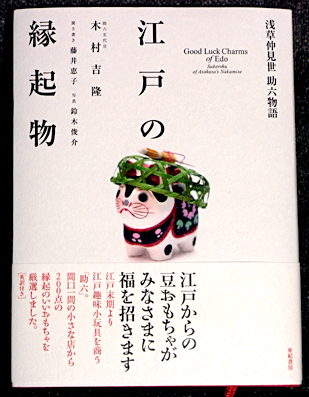 CLICK for more books about the toys of Edo.
. Tokyo and Edo Folk Art . Now let us look at some others. ma ga saru, 魔が去る, the bad luck is going to leave. SARU means also monkey, so the monkey might help to make your bad luck go away. 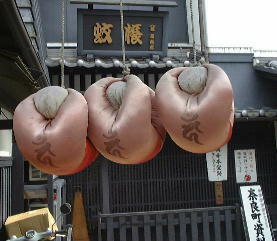 In the old part of Nara, ther is a special custom to hang out a small red monkey to ward off evil. A special Kooshin-do Hall (庚申堂) is dedicated to the blue-faced heavenly guardian called Kooshin-san. Good-luck charms modeled after a monkey, which acts as a messenger from Kooshin-san, are hanging at the eaves of houses in Nara-machi so that evil spirits can be driven away. The charm is called "Migawari-zaru," or a monkey of substitution, because the monkey is supposed to get disasters in place of people. One doll for each person of the home is hanged on the eves of the house. During one year according to the old lunar calendar, there are six Kooshin-days of the monkey. Three worms which inhabit the human body (san-shi no mushi) get out on these days and report the sins of the people to the gods. Kooshin was a popular deity that protected those who should be punished by the gods, and his messenger, the monkey, was therefore punished instead of the human sinner. Hence the name “migawari” “instead of my body”. Why would a monkey take on the punishment of human sins? This extremely famous story has been translated into English by Arthur Waley, MONKEY. Another name of the charm is "Negai-zaru," or a monkey for wishes. If you write your wishes on the monkey's back and hang it, your wishes are said to come true.
. san-shi no mushi, sanshi no mushi 三尸の虫 The Three Worms .
. medicine for kan no mushi 疳の虫 .
. Kooshin shinkoo　庚申信仰　Koshin Shinko belief .
. Folk Toys from Nara . 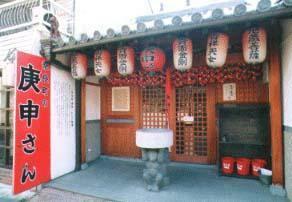 The Koshin-do Hall is dedicated to a blue-faced heavenly guardian called Koshin-san. Good-luck charms modeled after a monkey, which acts as a messenger from Koshin-san, are hanging at the eaves of houses in Nara-machi so that evil spirits can be driven away. The charm is called "Migawari-zaru," or a monkey of substitution, because the monkey is supposed to get disasters in place of people. This little folk toy comes from the Tohoku region of Northern Japan. This whimsical lacquered red papier-mache figure of an ox is known as an “aka-beko” which, literally translated, means red calf. Mid-20th Century. Her head, which is attached by a string, nods up and down and from side to side. 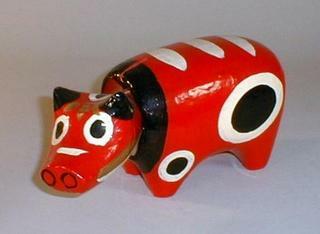 This little folk toy comes from Fukushima Prefecture in the Tohoku region of Japan. Some 350 years ago, the townspeople constructed a large temple there dedicated to Buddha. Heavy loads of lumber had to be transported long distances, and one of the oxen used was a large reddish cow. When the building was completed, she refused to leave the site. Shortly thereafter a member of the ruling clan fashioned a small effigy of the devout cow as a child’s toy. Made of lacquered papier-mache, the free swinging head bobs easily with any movement and delights children of all ages. When a great plague of smallpox swept the country, people appealed to Buddha for deliverance. 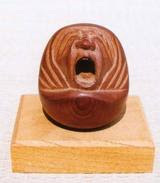 It was noticed that children who had this toy were not afflicted with the dread disease, and the superstitious local populace began to make similar toys as amulets against illness. (See “Mingei” by Amaury Saint-Gilles) Aka-beko are looked upon as omens of good luck and prosperity and are given as gifts at New Year’s and other auspicious occasions. Dimensions: 11” long, 5 ¼” high. Read a detailed essay by Mark Schumacher about the Monkeys in Japanese art and lore. !!! Founder of Zen Buddhism in China.Fill in one eye and make a wish. Fill in the other eye when the wish has come true. That is another version of our Daruma san.For the New Year, you get just one more than members of the family and pray for health and good luck. This is a doll and custom of Aizu Wakamatsu, Northern Japan. This wonderous fish called FUNA from Ibaragi prefecture helps cure smallpox too. Especially when you eat it. Legendary animal from China.Body like a deer, tail like an ox, hoofs like a horse, forehead like a wolf, with wings to take off to the clouds. Appears when a king was crowned in ancient China. Today a good beer!
. Kirinjishi 麒麟獅子 Kirin Lion Head . He pounds the herb of immortality to make the elixir of long life. 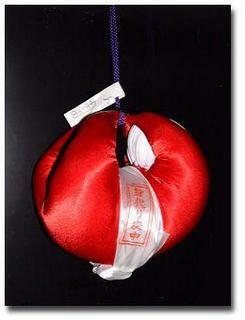 Usually held by the Daikoku, one of the Seven Gods of Good Luck. You hammer your straw, make sandals of it, sell them and voila, you are a rich man. At the entrance of a shop or restaurant, she helps pulling customers in the store.The left hand up beckons for financial luck,The right hand up for a thousand customers- or vice versa, who knows?! If your first dream of the New Year shows you this mountain, you are lucky for the rest of the year. Decorated and later eaten in a good soup.This is maybe the most common New Year decoration. A deity taken over from ancient Indian religion. Protector of the harvest.Usually with his buddy, the God of the Winds (fuujin raijin). Usually made of Shigaraki Pottery. He brings luck with many parts of his own body and things he is carrying. Go-en ga arimasu yoo ni! May we be bound by good fortune and good karma! 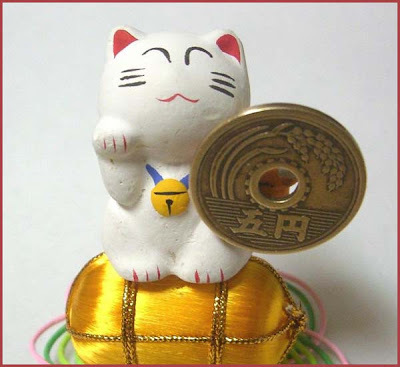 a pun with go en　五円 five yen coin !
. tashoo no en　他生の縁 karma relations and haiku .
. Engi food for the New Year .
. Engi Food - the Octopus . house. I will go with my elder daughter. It is cold rain day. I will buy a small Daruma here. Good luck, Etsuko san, and think of me! The white cloud of the summer.